When we transfer the carrier in tight and complicated space, the improvement of mobility is required. 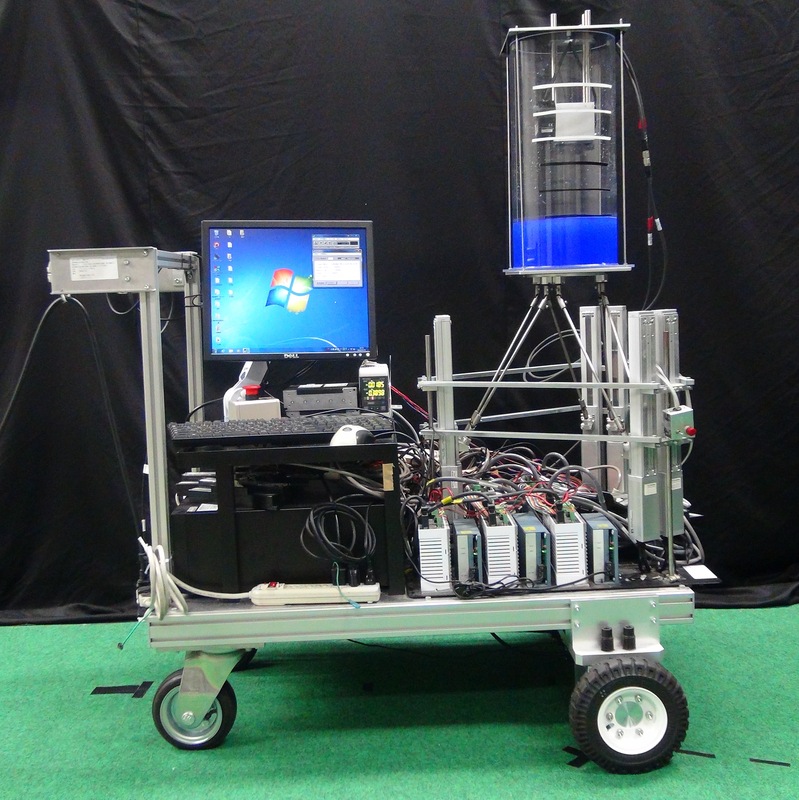 We study damping control and transfer control using omni-directional mobile robot with sophisticated mobility. 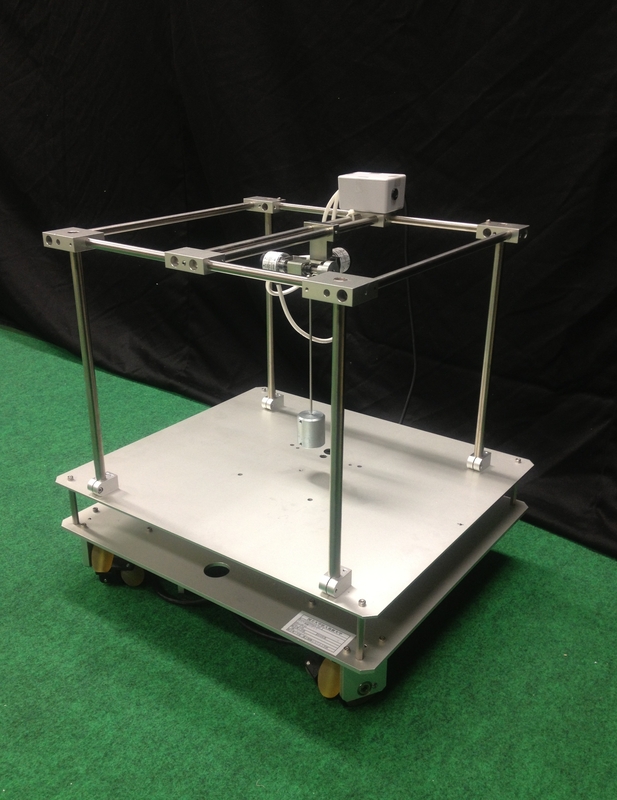 In our laboratory, we are using an omni-directional mobile robot having mecanum wheels. 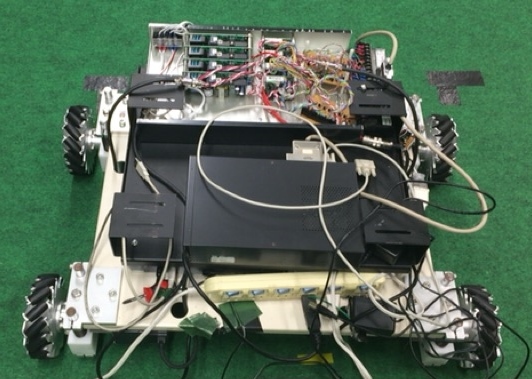 Using an accelerometer and gyro sensor on the robot, and a rotary encoder installed in the driving wheel, we construct an algorithm to estimate precisely the position and attitude of the robot. The robot is controlled to follow the target trajectory by using the estimator. 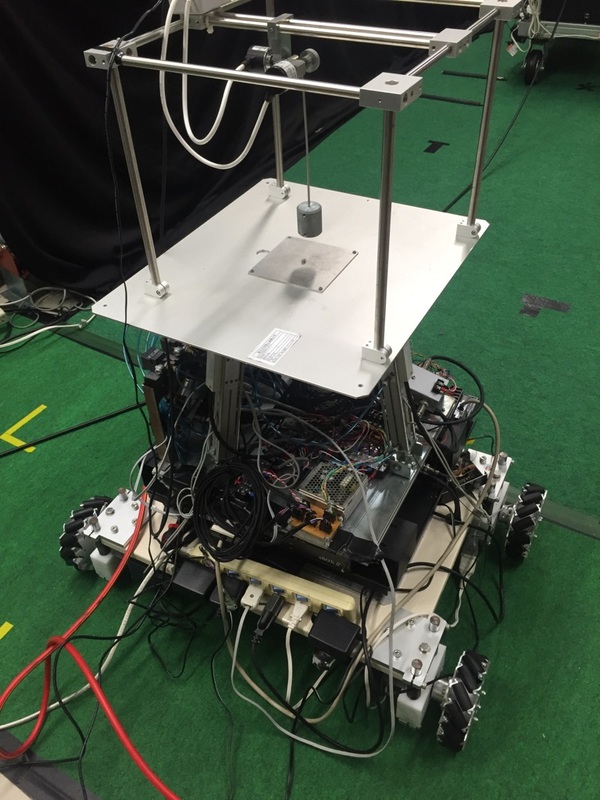 Even if there are errors in sensors and a slip of tire, it is required to estimate precisely the position and attitude of the robot. We study a transfer path design and an obstacle avoidance to suppress the vibration and the break of carriers. An object of the carrier is a liquid container or a spherical pendulum, which is easy to vibrate and is difficult to control. It is able to transfer the carried object without the vibration of that by an appropriate speed control and path planning of the robot. In the case of the obstacle avoidance, it is necessary to construct an algorithm considering the suppression of the vibration of the carried object. 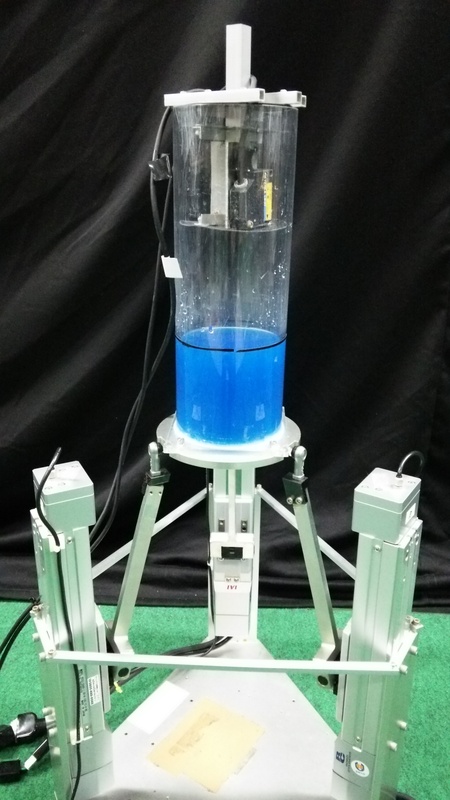 To damp the vibration generated by an avoidance action of the robot, we use an active vibration reducer which can tilt and move the carried object. When the active vibration reducer is used, the robot can transfer the carried object safely and stably on uneven roads and slopes. In our laboratory, the active vibration reducer has a parallel linkage mechanism. We propose an active vibration reducer having a parallel linkage mechanism. The parallel linkage mechanism gives high-speed and high-precision positioning because moving parts become lightweight due to all actuators installed on the base. In addition, it has a good feature that it is compacter than serial mechanisms. We install the active vibration reducer on the transfer cart or the mobile robot to damp the vibration of carried objects. An endplate is supported in parallel by three links. Each of them is connected to a linear actuator. Three degrees of freedom, the pitch and roll angles, and vertical displacement of the endplate, are controlled by the linear actuators. The endplate motion damp the vibration of the carried object, and level the endplate. An endplate is supported in parallel by six links. Each of them is connected to a linear actuator. Six degrees of freedom, the pitch, roll and yaw angles, and horizontal and vertical displacements of the endplate, are controlled by the linear actuators. Advanced control can be performed by using many degrees of freedom of the reducer.